This Gym's specialty is Normal Pokémon. This means that there are almost no recommended types of Pokémon to play, however Fighting-type are the exception to the rule as they are super-effective. Fortunately, Norman and his Gym trainers can be beaten with any team of balanced, well-trained Pokémon. 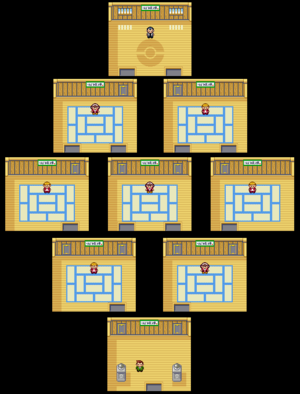 The Gym itself has a diamond-shaped layout; made up of nine rooms containing a trainer with only one Pokémon each. Depending on the ‘specialty’ of the room, each trainer gives their Pokémon an item on their first turn (except in the Recovery Room), therefore providing a different challenge in each room. To reach Norman, you only need to beat three trainers, but challenging all eight of course still gains valuable experience for your Pokémon. The layout of the trainer details below is a visual representation of the organisation of the trainers within the Gym. After you defeat Norman, he will give you the Balance Badge and TM42 Facade. You will also be able to use HM03 Surf, which can be obtained from Wally's Dad in the first house west of the Gym. Now you have the ability to Surf, you can return to Mauville City and continue your journey by heading to Route 118. To get back, you could retrace your steps in getting to Petalburg City (via Rustboro City, Rusturf Tunnel, and Verdanturf Town), or head east to Oldale Town before going north to Route 103 and Surfing across the water. This patch of land is just a short walk from the Trick House, just north of Slateport City and right next to the southern entrance to the Cycling Road. This page was last edited on 24 June 2017, at 13:39. This page has been accessed 100,214 times.